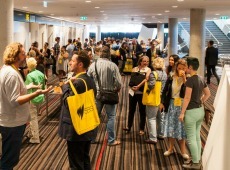 Net-Work-Play (the rebranded AIDC) took 450 Australian and international delegates to Adelaide from 22-25 February to share and sell ideas for factual series and documentaries. 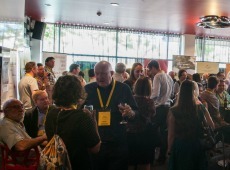 Among the delegates were Screen Queensland’s Head of Development and Production Jo Dillon and Director of Production Investment Dan Lake, plus a contingent of established and early career Queensland producers and filmmakers. Net-Work-Play 2015 sought to focus on opportunities for filmmakers to look beyond traditional broadcast and distribution methods while also providing access both in the conference program and the market to local and international networks, buyers and factual content producers, including some of the world’s leading players. 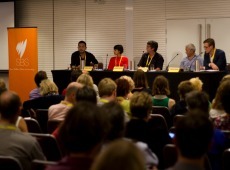 ‘There are real opportunities for Queensland factual producers and filmmakers,’ said Ms Dillon. ‘The conference signalled a genuine desire among the Australian networks, and one particularly passionately expressed by the ABC’s new factual team, to work with storytellers and stories outside of Melbourne and Sydney. ‘The big players in factual production are keen to work with Queensland talent, and these producing partnerships are being encouraged by broadcasters and buyers keen to see fresh stories while also feeling greater comfort around the ability of early to mid-career practitioners to deliver when they’re partnered with established production companies. Screen Queensland will keep you posted on any specific commissioning opportunities. The Development & Production team is also happy to answer any questions coming out of the market. For more information, please contact Screen Queensland P) 07 3248 0500 or E) development@screenqld.com.au.